It seems that current financial news is laser-focused on the crisis of skyrocketing student loan and credit card debt. While it's easy to focus on what the average American owes, we often forget that there is a savings crisis going on at the same time. According to a 2017 GOBankingRates survey, more than half of Americans (57 percent) have less than $1,000 in their savings accounts. An astounding 39 percent of Americans have no savings whatsoever. Retirement savings aren't faring well, either. According to a 2016 retirement confidence survey, more than a third of workers over age 50, and half the surveyed retirees, had less than $25,000 put away for retirement. Imagine trying to live the decades of your golden years on such a small nest egg. It is time to save more money. Start following these savings goals for every decade of your life, and you won't end up as a sad savings statistic. Don't waste your 20s thinking you have plenty of time to earn more and save more. Putting away even a small percentage of your income each month can translate into big savings by the time you hit your 50s. In your 20s, your first goal should be to start an emergency fund and build it to $1,000. Setting up this emergency fund gives your finances a little cushion so that you can avoid dipping into debt every time something goes awry. Once you hit the $1,000 mark, build up your emergency fund to three to six months' worth of daily living expenses. This will protect your finances even further against expensive emergencies or a job loss. If your company offers automatic deductions from your paycheck into a 401(k) each month, make sure you're enrolled so you won't have to consciously make the sacrifice. If you work for a company that offers a 401(k) match on a percentage of your contributions, make sure you're contributing enough to get that match. Otherwise, you're leaving free money on the table. With the growing pains of your 20s out of the way, it's time to step up your personal finance game. 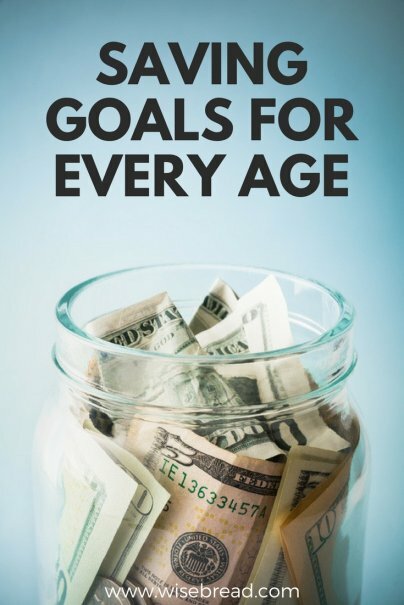 During this decade of your life, you'll ideally start earning more money and keep the ball rolling on your savings goals. Remember to steer clear of unnecessary debt: In your 30s, you may be balancing a student loan with a new mortgage payment, so the less additional debt you take on, the easier it will be to reach your money goals. At this point, your emergency fund should still have enough to cover a year's worth of living expenses. Once you've built enough safety savings, your extra dollars would better serve you elsewhere. As mentioned above, retirement is a major priority now. It's more important to build your retirement savings than it is to put away money for your kids' college tuition or an unnecessary expense like a family vacation. Your kids will have options when they attend college, whether in the form of student loans, scholarships, or AP credits. You will not have any options if your retirement savings are not enough. Your emergency fund should still reflect at least a year's worth of living expenses. If you have an aging relative who may need your care, or a health issue that threatens to leave you out of work, you may need to build your emergency savings further. Your 50s are also the time to get serious about debt repayment. At this point, high-interest credit card debt is a large threat to your financial wellbeing. When you retire, you'll be living on a fixed income. If you didn't save enough money throughout your working life, that income may not be very high. The last thing you'll need to worry about are the bills piling up for your credit cards, car loans, or mortgage payments. Tackle these things as best as you can, now. The less debt you bring into retirement, the better. Before you leave your 50s, strive to have six times the amount of your annual salary saved for retirement. Your portfolio should now be managed as fairly low risk, though with people living longer than ever, it may still make sense to own a few higher-risk investments such as stocks. You are on the cusp of retirement, but this doesn't mean now is the time to slack off on savings. You should be working extra hard toward your goal of financial stability for your golden years. The goal is to enter retirement with very little financial worry. You still need an emergency fund in retirement. If you don't have any liquid savings set aside for a crisis, focus on building that up. If your emergency fund is stocked, every extra dollar should go toward contributing the max on your retirement accounts and paying off the rest of your debt. Even in an ideal scenario, you'll still be relieved when you're ready to officially kick off your retirement with a well-stocked nest egg. How are you faring for your age group? Do you need to save more or are you right on track? If you are behind, don't get discouraged; now is the time to get your budget under control and accelerate your savings for a financially secure future.